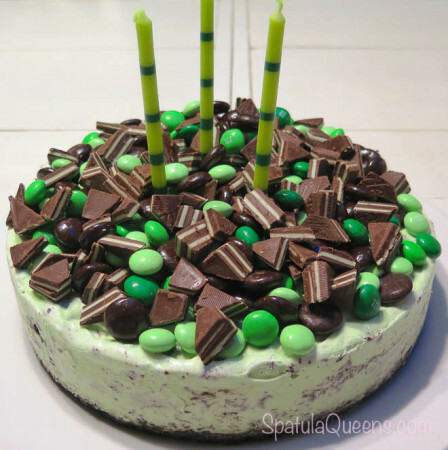 Mint chocolate ice cream cake! This is not healthy, organic or low-cal. It is easy, no-bake and most important, what our grandson, Josh, wanted for his birthday. One quick trip to the grocery store for a half gallon of mint ice cream, Mint Oreos, Magic Shell chocolate topping and an assortment of mint chocolate candy and we had a party cake! The cream filling binds the crust so no need to add other fat, like butter. I crunched the whole package of Oreos in the food processor and used about 2/3 of the crumbs for the base, pressing it into the bottom of a prepared springform pan. All the filling from the cookies serve as a binder for the crumb crust eliminating the need to add any kind of binder like butter. Using plastic wrap to line the bottom of the springform pan made it way easier to remove the whole thing and transfer to a serving plate. 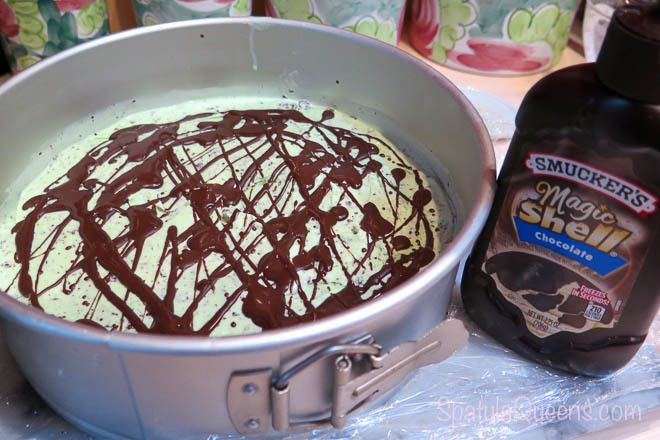 For the bottom layer, spoon about half the ice cream over the prepared crust and smooth out. 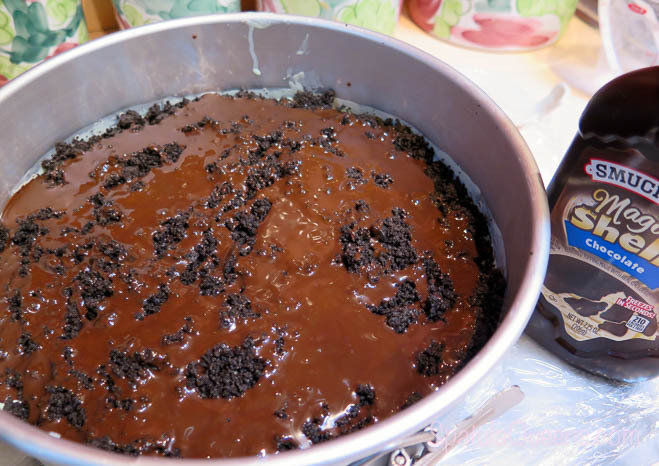 I wanted this to be more than just a half gallon of ice cream spread over a crumb crust – a little more interesting, with more texture, so I used the remaining Oreos crumbs and Magic Shell for a middle layer. Magic Shell is liquid in the bottle but is crunchy when chilled, like the chocolate coating on an ice cream bar. 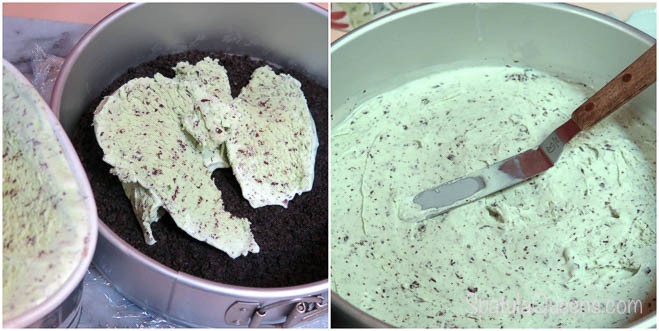 Squeeze Magic Shell topping over the ice cream, sprinkle with the remaining Mint Oreo crumbs then top with some more Magic shell. Return to the freezer until firm, about 10 to 15 minutes. If your kitchen is really warm, you might want to return the other half of the ice cream to the freezer too. When Magic Shell and Oreo crumb layer is firm, spoon remaining ice cream over the top and smooth. Return to freezer for at least two hours. 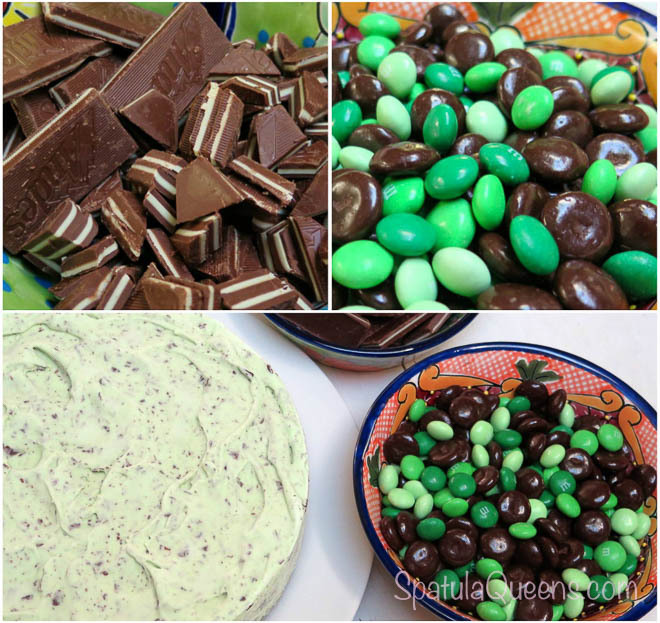 While ice cream layers are freezing, unwrap all the candy and cut Andes mints into small pieces. 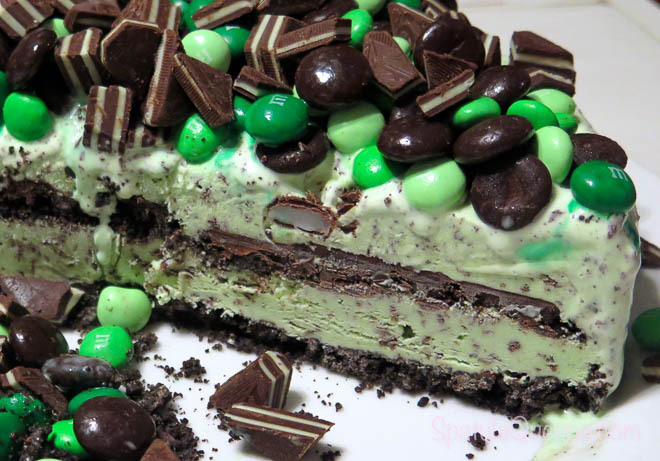 I used Junior Mints, Mint M & M’s and Andes chocolate mints bars. Just before serving, squeeze a little more Magic Shell onto the top, load up the candy and serve. Note: leftovers can be returned to the freezer, but the candy, when frozen, is difficult to cut and eat. Maybe you should just finish it all up now! This is not healthy, organic or low-cal. It is easy, no-bake and most important, what our grandson wanted for his birthday. Prepare the pan by covering the bottom of the springform pan with plastic wrap then assemble the pan. Using the plastic wrap will make it easier to remove the cake from the pan for serving. 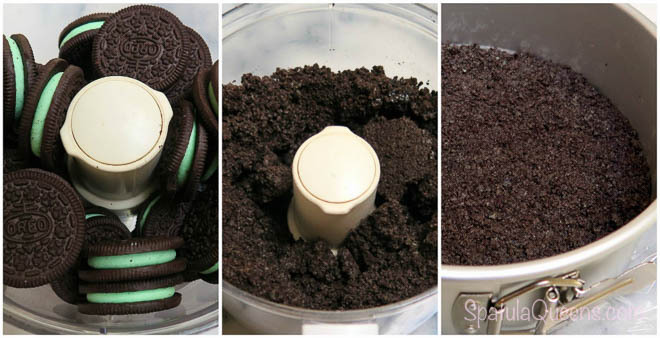 Place the Oreos in food processor and process to coarse crumbs. Press approximately ⅔ of the crumbs into the bottom of the prepared pan and place in freezer for about 30 minutes. 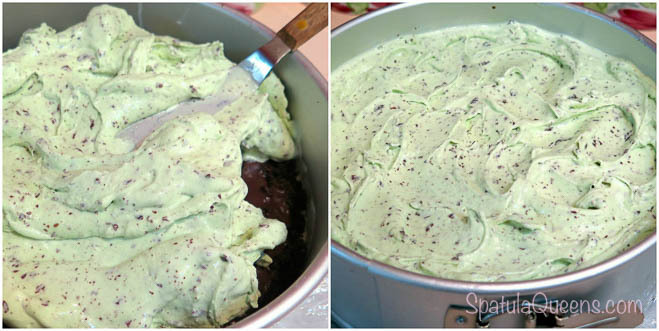 Remove the ice cream from freezer and allow to soften enough to be spreadable. Working quickly, scoop half the ice cream over the bottom crust and smooth out. If the ice cream is getting too soft, return the pan to the freezer until it is firm. Squeeze Magic Shell over the ice cream. Sprinkle remaining Oreo crumbs over the Magic Shell and top with more Magic Shell; return to freezer until firm - 10 to 15 minutes. Spoon the other half of the ice cream over everything and spread evenly. While the ice cream cake is in the freezer, unwrap the candy and cut the Andes mints. 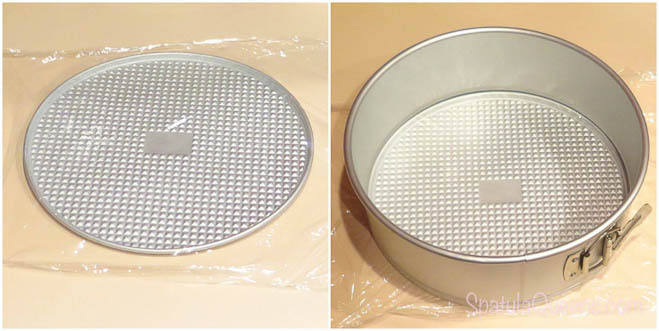 To serve, remove the side of the springform pan and transfer the cake to a serving platter using a spatula to lift the cake, allowing removal of the plastic. Squeeze out more Magic Shell and top with all the chocolate and mint candy. Serve immediately. Note: any remaining ice cream cake can be stored in the freezer, but it is more difficult to cut and eat when the candy on top is frozen.